In the Transport of respiratory Gas unit is an extension of Topic 6.4 Gas Exchange. 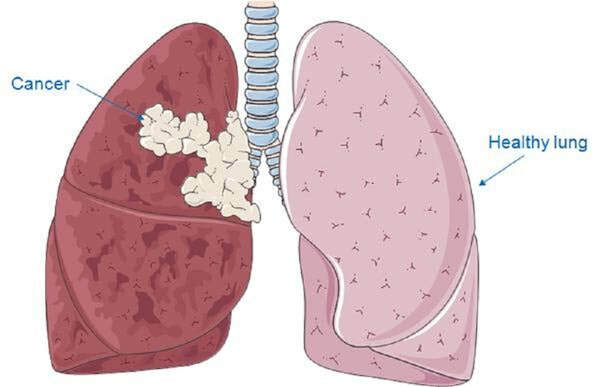 In this unit you will learn about the structure and function of the lung and how oxygen is absorbed into the blood. We will also learn how exercise and altitude can affect the ventilation process. Last we will learn how different diseases can affect the function of the lung. Red blood cells are vital in the transport of respiratory gases. D.6 U 1 ​Oxygen dissociation curves show the affinity of hemoglobin for oxygen. Hemoglobin protein transports oxygen. The hemoglobin protein has 4 polypeptide chains. Each one of those chains has an additional non amino acid part called a heme group. Each heme group has an iron atom. Oxygen attaches to the Iron molecule. One hemoglobin molecule can carry 8 oxygen atoms - an O2 on each iron atom and so oxyhemoglobin is often written as HbO8. 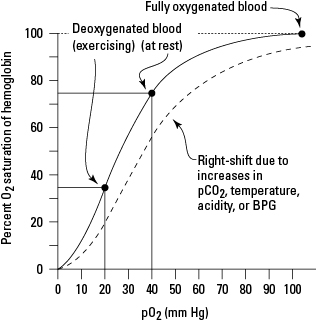 ​Oxygen dissociation curves show the affinity of hemoglobin for oxygen. You can watch this animation to see the different levels of saturation of oxygen at different partial pressures of oxygen (term for concentration of a gas in a mixture of gases). D.6 U 2 ​Carbon dioxide is carried in solution and bound to hemoglobin in the blood. as hydrogen carbonate ions (HCO-3) that are dissolved in the plasma. D.6 U 3 ​Carbon dioxide is transformed in red blood cells into hydrogencarbonate ions. Most of the carbon dioxide, however, is converted into bicarbonate. Carbonic anhydrase is an enzyme in the red blood cells that quickly converts carbon dioxide and water into bicarbonate and hydrogen ions. The equation for this reaction is as follows: Carbon dioxide and water are converted to bicarbonate and hydrogen ions, where HCO3- is bicarbonate and H+ is hydrogen ion. 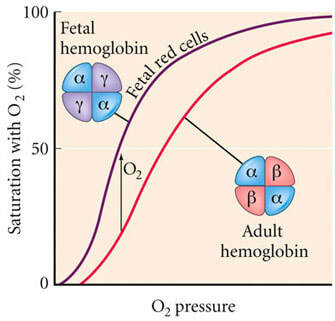 D.6 U 4 ​The Bohr shift explains the increased release of oxygen by hemoglobin in respiring tissues. ​Increased metabolism results in increased concentrations of carbon dioxide in the blood which in turn lowers blood pH. This increased acidity shifts the oxygen dissociation curve to the right and so results in a greater release of oxygen (at the same partial pressure of oxygen). This supports aerobic respiration in the active tissues. The movement of the graph to the right is called the BOHR SHIFT. D.6 U 5 ​Chemoreceptors are sensitive to changes in blood pH. Respiratory chemoreceptors work by sensing the pH of their environment through the concentration of hydrogen ions. Because most carbon dioxide is converted to carbonic acid (and bicarbonate ) in the bloodstream, chemoreceptors are able to use blood pH as a way to measure the carbon dioxide levels of the bloodstream. These are located on the ventrolateral surface of medulla oblongata and detect changes in the pH of spinal fluid. They can be desensitized over time from chronic hypoxia (oxygen deficiency) and increased carbon dioxide. These include the aortic body, which detects changes in blood oxygen and carbon dioxide, but not pH, and the carotid body which detects all three. They do not desensitize, and have less of an impact on the respiratory rate compared to the central chemoreceptors. 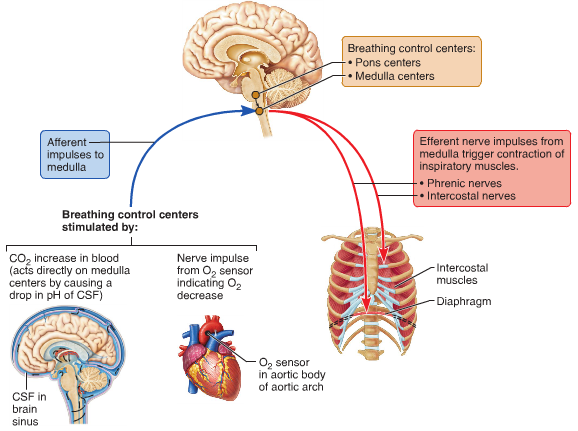 The rate of ventilation is controlled by the Respiratory Control Centre in the medulla oblongata (Links to an external site.) Links to an external site. region of the brain. Two sets of nerves travel from this region - the intercostal nerves to the intercostal muscles and the phrenic nerves to the diaphragm. D.6 U 7 ​During exercise the rate of ventilation changes in response to the amount of CO2 in the blood. During exercise the rate of ventilation changes in response to the amount of CO2 in the blood. Increased CO2 leads to a drop in blood pH. Chemoreceptors in the walls of the carotid arteries and the aorta, as well as chemoreceptors in the medulla itself, detect this pH change and send impulses to the Respiratory Control Centre in the medulla. Nerve impulses are sent along the intercostal and phrenic nerves causing them to increase ventilation rate. If blood pH falls below 7.35 then the chemoreceptors we mentioned above increase the rate of ventilation and carbon dioxide is removed form the body. This CO2 has been formed at the alveolus from HCO-3 ions being added to H+ ions to form water and CO2. This has the effect of withdrawing the H+ ions from the blood. As pH is a measure of the amount of H+ ions then less of these ions means that the pH rises and the blood gets less acidic. The kidney also plays a role in maintenance of blood pH. The kidney can secrete H+ ions into the urine in order to raise pH (less acidic). Greater amounts of hydrogen carbonate ions can be absorbed from the filtrate in the kidney which allows more CO2 formation at the lungs as outlined earlier ( ultimately less H+) and the resultant increase in pH. D.6 U 8 ​Fetal hemoglobin is different from adult hemoglobin allowing the transfer of oxygen in the placenta into the fetal hemoglobin. Fetal hemoglobin (HbF) is the main oxygen transport protein in the human fetus during the last seven months of development in the uterus and persists in the newborn until roughly 6 months old. Functionally, fetal hemoglobin differs most from adult hemoglobin in that it is able to bind oxygen with greater affinity than the adult form, giving the developing fetus better access to oxygen from the mother's bloodstream. D.6 A 1 ​Consequences of high altitude for gas exchange. Gas exchange at high altitude can be a problem as the partial pressure of oxygen is low and Hb may not be fully saturated. Red blood cell numbers increase in response to this problem. Ventilation rate increases. Muscle produce more myoglobin (a protein that can store oxygen in muscle cells and only release it when haemoglobin is depleted). 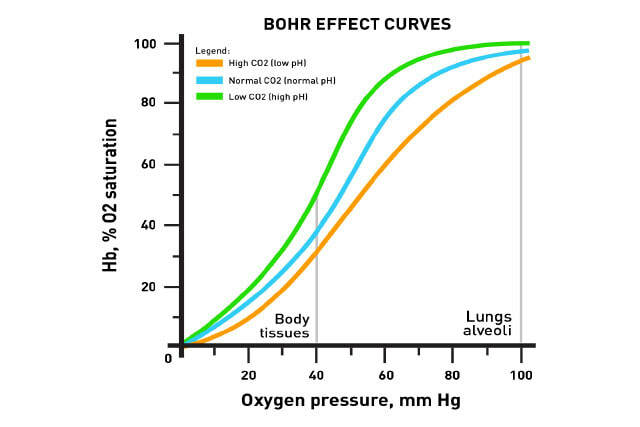 Populations who have lived for long periods of time at high altitudes have oxygen dissociation curves that are shifted to the left to encouraging O2 loading at low partial pressures of oxygen. They also have greater alveolar surface area and larger vital capacities. The rapid breathing rate can result in the expulsion of too much carbon dioxide form the body leading to an increase in blood pH called alkalaemia (alkaline blood). If untreated this condition can lead to pulmonary edema and cerebral edema (fluid on lungs and brain respectively). Both conditions are rare (<1% of unacclimatised climbers) and the reasons for edema in these cases are poorly understood. This can lead to unconsciousness and death. The only treatment is to descend the mountain. Upon descending the mountain the problem will be rectified as the kidneys will secrete HCO3- ions in the urine (alkali urine). The bodies response will be to replace to HCO3- ions and in the process H+ ions are formed. This reduces the pH to normal levels again. D.6 A 2 ​pH of blood is regulated to stay within the narrow range of 7.35 to 7.45.
reaction below moves to the left. The removal of H+ raises the pH again - back to within normal range. D.6 A 3 ​Causes and treatments of emphysema. form burning wood, rubbish, coal etc. poorly ventilated will have high Radon levels which will be inhaled and result in respiratory gases. of developing lung cancer). Note asbestosis is not on the syllabus. Consequences to include difficulty breathing, coughing, coughing blood, chest pain, loss of appetite, weight loss, anxiety, surgery to remove tumor, 15% live for >5 years. phagocytosis in alveolar tissue normally engulf bacteria and release protease enzymes (e.g elastase) to digest bacteria inside engulfed vesicles. A1AT inhibitor prevents damage to our own lung tissue. Smokers have less A1AT production and the effectiveness of it is less (this may also be genetic). Therefore approx. 30% of smokers have protein degradation in alveoli walls and they weaken and are eventually destroyed. D.6 S 1 ​Analysis of dissociation curves for hemoglobin and myoglobin. ​Myoglobin is an oxygen binding protein found in almost all mammals. It serves as a store of oxygen in muscles and it only releases it's attached oxygen when hemoglobin has already depleted its supplies. The partial pressure of oxygen in the tissues must be very low before myoglobin will dissociate its oxygen. This allows aerobic respiration to continue at very low partial pressure of oxygen in actively respiring tissues e.g. cardiac muscle. ​All mammals have myoglobin in their muscle cells but some have more than others. Diving mammals e.g seals will have high levels of myoglobin stored in their muscle cells. 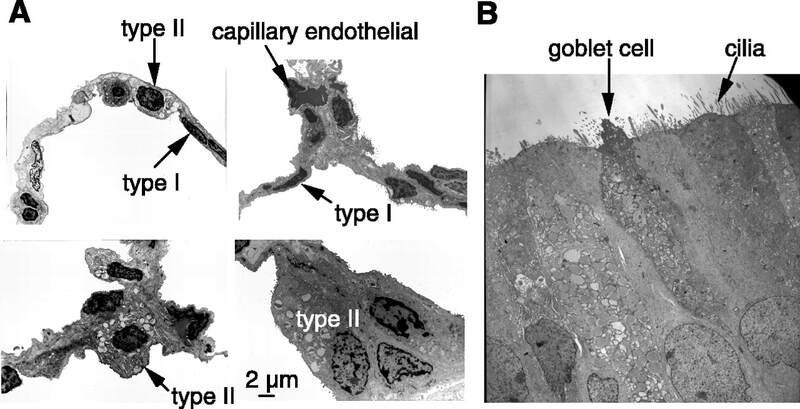 D.6 S 2 Identification of pneumocytes, capillary endothelium cells and blood cells in light micrographs and electron micrographs of lung tissue. Expedition medical officer, Monica Piris, talks about the dangers at altitude and the value of acclimatization from Base Camp at 5,200m (17000ft). ​What is emphysema? 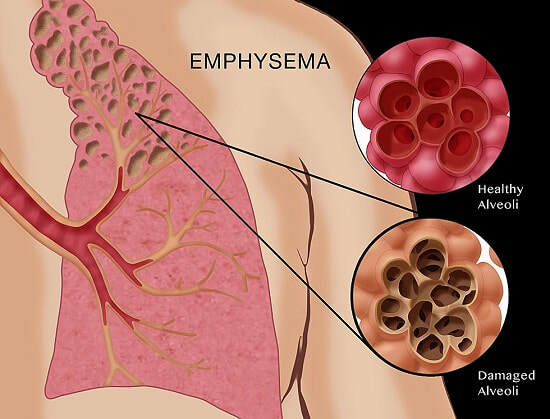 Emphysema's a type of chronic obstructive pulmonary disease (COPD) where the connective tissue in the lungs breaks down, obstructing the airways.